Believed in the middle ages to be Aristotle?s letter to Alexander the Great, ?About the Secrets of Secrets? concerns government and is a Latin translation of an Arabic work. A London scribe and King's Clerk, Walter of Milemete, and a team of artists probably made this richly decorated copy in 1326-1327. 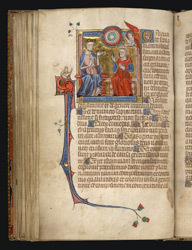 Milemete intended it to accompany his own treatise on royal virtues for presentation to Edward III. The 'Secrets' was owned by the Earls of Leicester, at Holkham Hall in Norfolk, from the 17th to the 20th centuries. Following an instruction on miraculous stones and plants, this page begins with a panegyric address to Alexander and instructs him to learn higher truths from observing God's creation, as Plato did when speaking of the creation of colour. The illustration shows the king and Aristotle engaged in a discussion while an angel presents a disc of rainbow-like colours in the heavens.